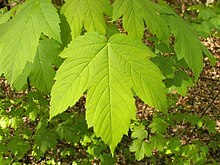 Acer /ˈeɪsər/ is a genus o trees or shrubs commonly kent as maple. ↑ Stevens, P. F. (2001 onwards). Angiosperm Phylogeny Website. Version 9, June 2008 [and more or less continuously updated since]. http://www.mobot.org/MOBOT/research/APweb/. This page wis last eeditit on 25 Mey 2014, at 13:03.